It’s one of our favorite times here at the Matthews Library: Thanksgiving week! As everyone at SCDS prepares for Thanksgiving break filled with turkeys, pumpkin pies, and a variety of carbohydrates, we wrapped up the two day week with a Thanksgiving advisory lunch. 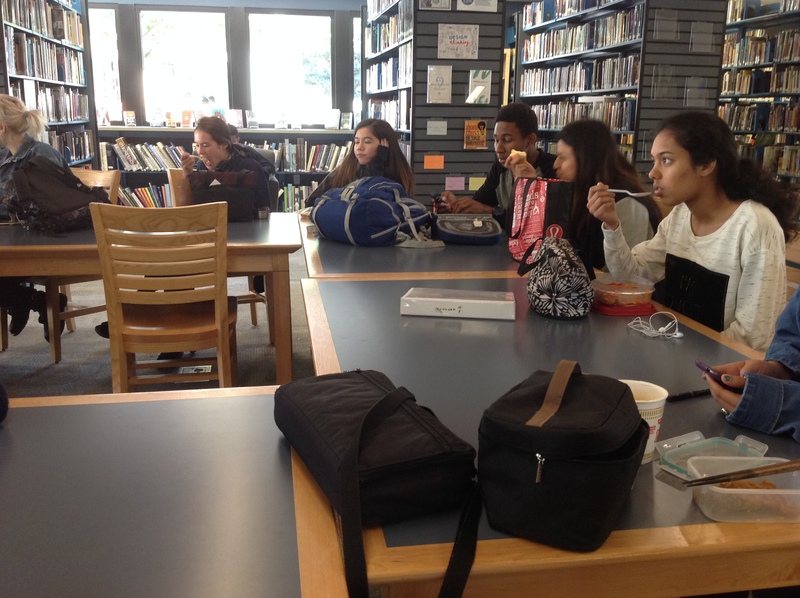 Every year, the High School advisories have turkey sandwiches and share potluck dishes with their fellow classmates. Ms. Melinson’s advisory had quite the buffet: warm mashed potatoes, brussels sprouts, and pies were highlights of the lunch. Ms. Melinson also did some prep work for our annual Winter Craft workshops in December. Can you guess what these will be? 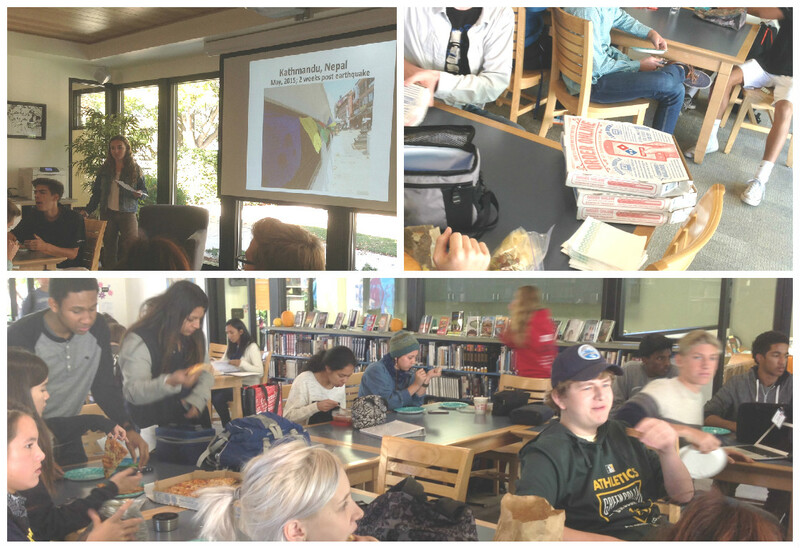 We had a couple of our favorite events in the library this week, dear readers, both which center around our love of books, poetry, and food! Wednesday we had our monthly Book Club, where the brownies were ooey-gooey and the apple cider was nice and hot—and, you know, we all talked about the awesome books we’ve read since the last meeting. Friday during lunch we had the biannual Glass Knife Speakeasy. Students and faculty read their favorite poems; Gabi read a couple of rad original pieces, and Brandy shared a beautiful poem (that she memorized!) called “The African Child Will Dance,” and Diego sang a song accompanied by guitar. The vibes were groovy, and everyone enjoyed themselves with plates full of cookies, cheese, and fancy breads. We’ll have another Speakeasy at the end of February/beginning of March, so be sure to catch it! Wednesday we were delighted to have another Book Club filled with great conversation, brownies, and hot apple cider galore! In fact, Ms. Melinson even made extra hot apple cider—because we know it’s getting cold outside and there’s nothing better than warm apple cider to warm things up! Ms. Melinson talked about the new David Mitchell book, Slade House—which sounds intriguing and slightly spooky—about a mysterious building in an alley that one is lucky to find the entrance to…and once they enter…they may not be able to ever leave (dun dun dun!). Vanessa was very excited to see that we added a copy of the graphic novel Motherless Oven to the collection. She talked about it at the last Book Club and we thought it sounded too awesome to pass up! Dr. Baird was eager to share the novel he just read by Richard Matheson, The Beardless Warriors. Dr. Baird said he does not often get the chance to read novels, but this one was fantastic and depicted a realistic narrative of what the world was like for young men during WWII. The topics ranged from old-school science fiction to Greek tragedies, to some hefty political debates…and some really great book recommendations! For a complete list of those books check out our Goodreads page here. Your Week in Review: Prepare Yourselves. 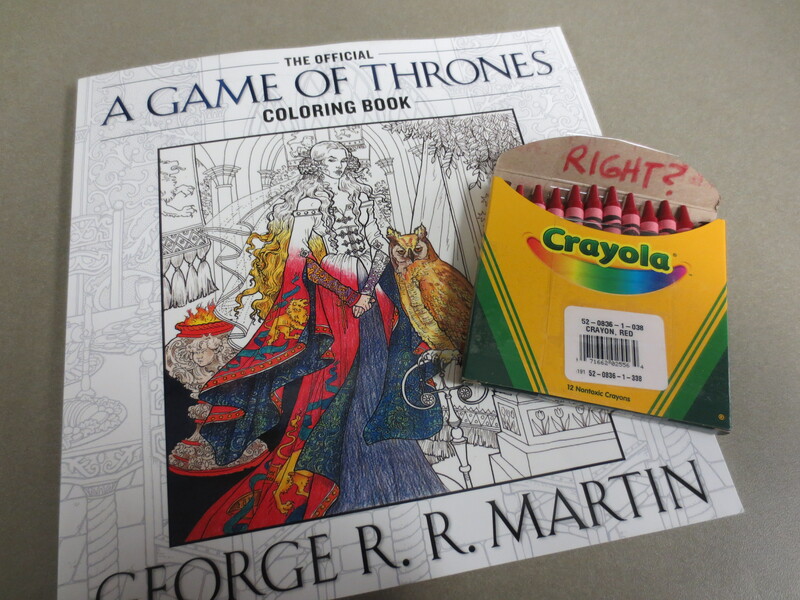 Winter Craft is Coming. We celebrated Veteran’s Day on Wednesday—and hope that everyone had a nice little mid-week break to remember those that fought for our country. We also had a very productive Glass Knife meeting, where the theme for this year’s book was heavily debated (and super top secret!). 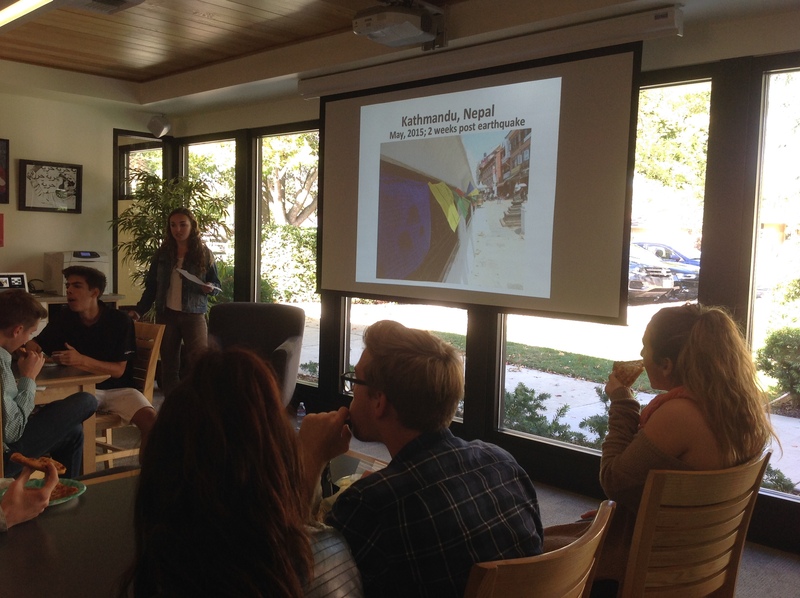 For Leadership Lunch on Wednesday, Elie talked about her trip to Nepal, where she volunteered with her dad to bring medical relief to earthquake victims and other citizens. She had a valuable experience and enjoyed working with the kids the most. And Julia, our Leadership Lunch Coordinator, did a great job providing pizza for everyone. You guys rock! 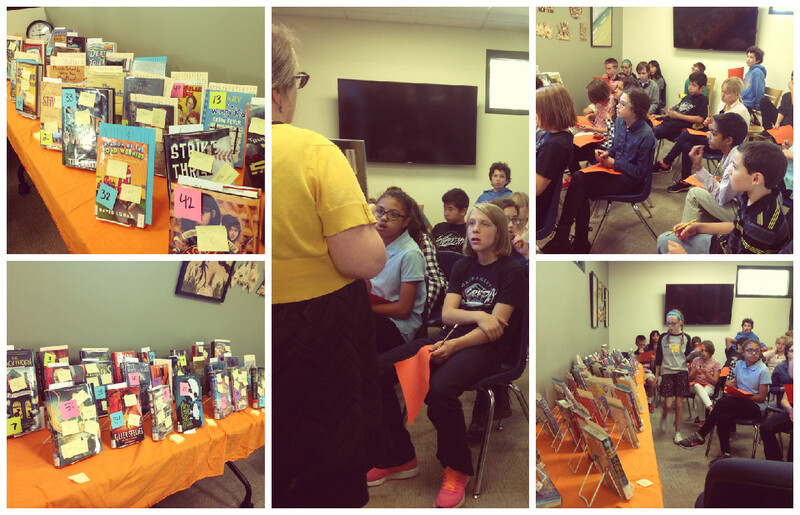 We also had the 6th and 7th Grade English classes in the library for Fall Book Talks. Ms. Melinson shared dozens of titles (a lot of them ~*spooky*~!) and students were able to check them out/place holds on them to get a jumpstart on their reading for Fall. Fun! 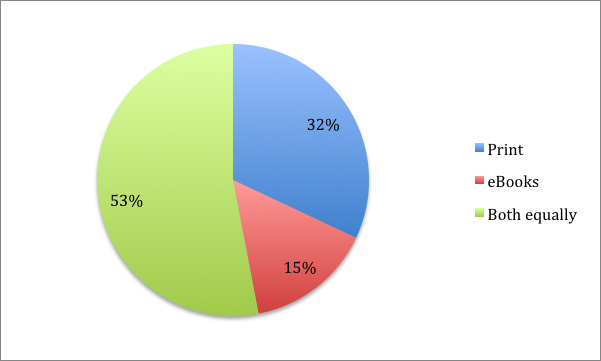 Each year we survey our 6th graders on their reading habits, and the results are always interesting. Last year we were surprised to see that interest in dystopian books (71%) was continuing to rise as it has been since Hunger Games was published. In fact this year, interest went even higher to 75%. While mystery books continue to rise also, this year’s revelation was that interest in Adventure books rose from 77% to 86%. Another surprise from last year was that the popularity of eBooks has gone down with our students since their introduction and this year’s survey showed that is still the trend. We also had some clues as to why they prefer print including the inconvenience of running out of juice while you’re reading and having to recharge. This year 6th graders were asked “Do you prefer print books or ebooks?” Nearly 55% of them prefer print. 6th graders in 2012 were asked the same question, and here’s how they answered. Only 32% of them preferred print. This year we also asked those 6th graders from 2012 who are currently in 9th grade a similar question, and here are the results. It seems their tastes have changed with almost 64% of them preferring print. Another thing we noticed is that while in 2012 most students who read ebooks used Kindles, now they’re twice as likely to use an iPad, phone, or computer rather than a Kindle. We use our survey results to help us make decisions through the year. This year we surveyed all of the high school students in addition to our 6th graders. Since great numbers of students (83%) prefer to be able to talk in the library, the main library will remain the louder room in the library with the smaller room used as our Quiet Room. We’ll be playing classical music one Friday each month since many students (68%) like that idea. Students voted tea and chocolate tastings as their favorite activities to relieve stress with coloring and yoga coming in second. 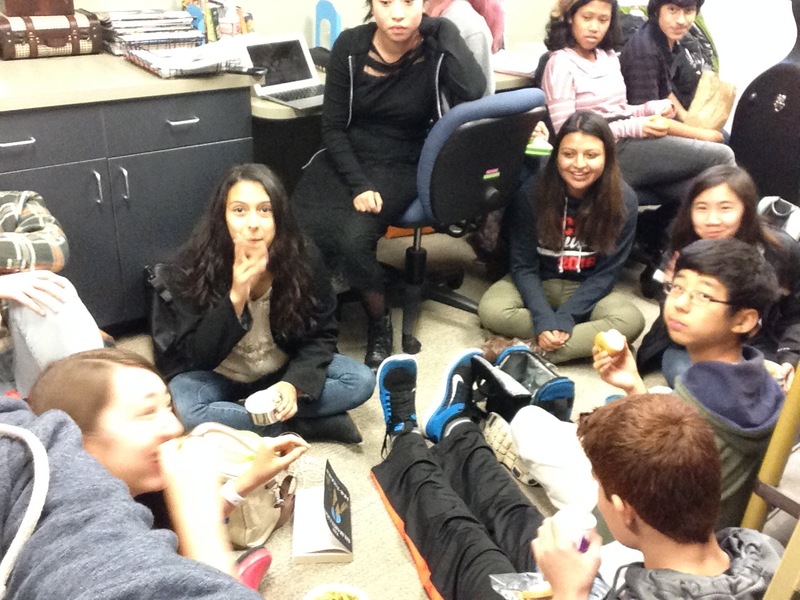 We’ve also started “Chill Sessions,” informal lunchtime discussions.